(Oct. 18, 2017) -- Since his arrival at the beginning the current academic year, UTSA President Taylor Eighmy has been very busy meeting with faculty, staff, students, administrators, alumni, donors, elected officials and local community members. Outlining his vision of the future of UTSA, President Eighmy identified five themes that he will be focusing on going forward. Those themes include becoming a great multicultural discovery enterprise, an exemplary urban-serving university of the future, world-engaged, a fertile landscape for the cultivation of excellence among faculty/staff/students, and an institution known for operational and infrastructure excellence. Great cities need great universities and great universities need great cities. 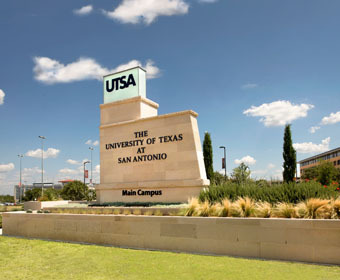 Active engagement with San Antonio’s research and high-tech industries, K-12 school systems, health care providers, cultural establishments and governmental entities will pave the way, solidifying UTSA’s role as a driver of San Antonio’s rich and diverse cultural and economic ecosystem. For our students and faculty, San Antonio serves as a living laboratory, providing opportunities for experiential learning and developing the leaders of tomorrow. UTSA will serve as the city’s anchor for cradle to career education, economic development and community engagement. Our mission is to help all San Antonians realize their dreams and attain prosperity. According to a definition from the Coalition of Urban Service Universities (USU), an urban-serving university is about more than being located in an urban area. It means that the university must be – and be seen as – an anchor institution, an essential component of the social, cultural and economic well-being of the community. Expanded student access and support programs to increase student success. Relevant, applied research that is responsive to the needs of the community. Development of community partnerships that tap into the full range of the university’s resources, expertise, talent and technology. Serves as a catalyst for economic development. The Coalition of Urban Serving Universities (USU) is a president-led organization committed to enhancing urban university engagement to increase prosperity and opportunity in the nation's cities, and to tackling key urban challenges. Membership includes more than 35 public urban research universities representing all U.S. geographic regions. The USU agenda is guided by three capabilities Research, Public Engagement, and Policy. Current projects address these issues by facilitating transformations in student success pathways, encouraging campus-community partnerships to build strong communities, and ensuring greater diversity in the healthcare industry. Additional details remain forthcoming from President Eighmy. It is clear, however, that based on the models of USU peer and aspirant institutions and communities, both San Antonio and UTSA remain well-positioned for a bright future indeed. This article was originally published on Oct. 16, 2017 in the San Antonio Business Journal.